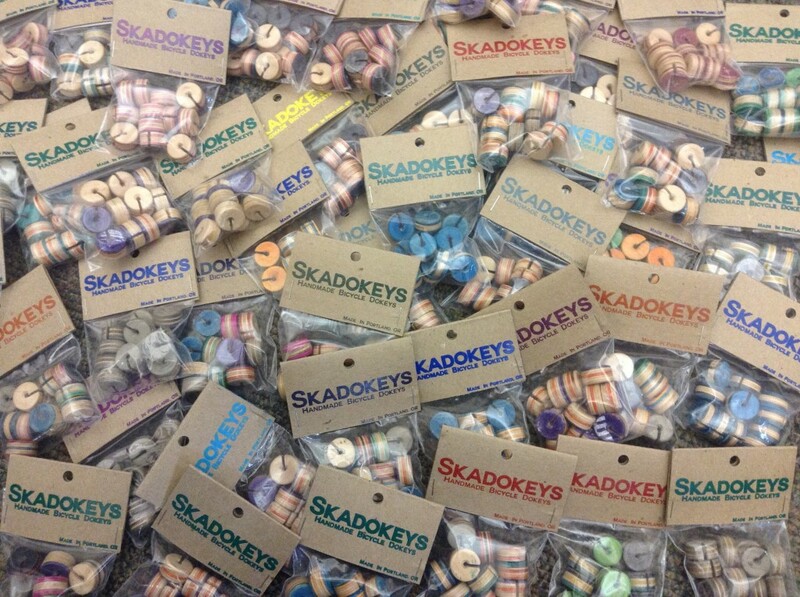 Home » Blog » Product review: Skadokeys! Here at our shop, some of our most cherished bike parts are the cheap accessories that get salvaged from inexpensive kids’ bikes. Why? Because kids get all the sweet stuff—sparkly brake housing, frame pads that say “Terror of Demon Storm,” miniature handle-bar mounted bikes for your Barbie and, of course, spokey-dokes. For those of you unfamiliar with the latter, spokey-dokes are basically colorful plastic beads that attach to your bicycle spokes that slide up down as your wheels turn. Not only do they add pizzazz to your ride, they also make a most enjoyable percussive noise when you cruise slowly down the street. But, maybe little plastic beads are not your thing; maybe you don’t want to buy more cheap plastic thrills, or maybe you do but you’ll just feel guilty about it. 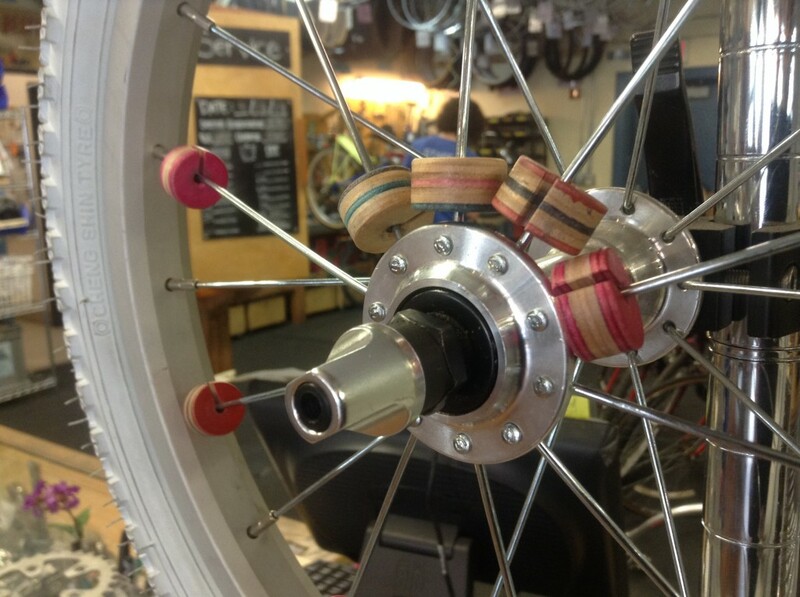 Well, in that case, consider these: Skadokeys, the Handmade Bicycle Dokeys!! 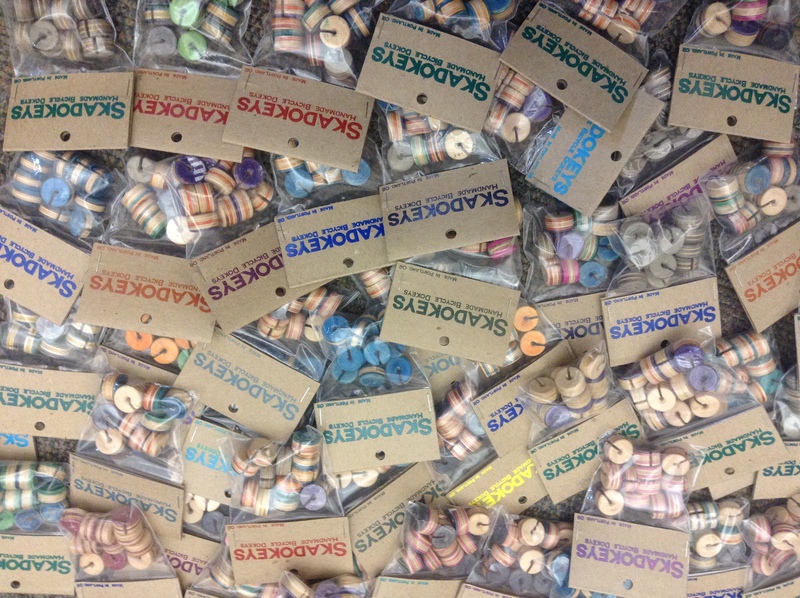 Made by hand right here in Portland, OR, Skadokeys are the BEST spokey-dokes on the market. And, not only are they locally made, but they are non-toxic and are manufactured completely from recycled skateboard decks! The dyed layers of laminated plywood give Skadokeys a crafty and colorful look and lend them a richer percussive tone that you cannot get from traditional plastic dokeys. For the most optimal Skadokey action, be sure to clean your wheels (and spokes) prior to installation and do note that they work best with 14 gauge round spokes. At only $10 for a dozen dokeys, be sure to get a set for your whole family! !